XPOL is a compact, transportable polarimetric weather radar. 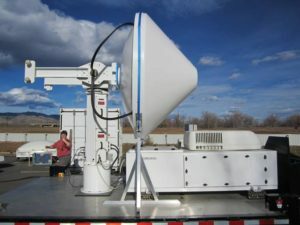 A photograph shows an XPOL system delivered to the US National Center for Atmospheric Research (NCAR) in 2012. Based on a modified marine radar RF unit, the XPOL system achieves high performance at a low cost. XPOL is specifically designed to sample backscatter from precipitation over an area of approximately 70 km x 70 km. 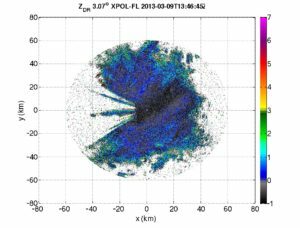 XPOL collects reflectivity, Doppler velocity data, key polarimetric radar parameters, to characterize clouds and precipitation. 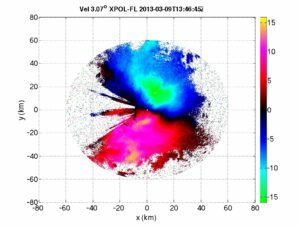 The measured polarimetric radar data is automatically post-processed and displayed with Titan/Hawkeye software (developed by NCAR) to provide real-time meteorological data products (Z, Vel, σvel, Zdr, Φdp, Kdp, ρhv). The Hawkeye software package also provides hydrometeor classifications and automatic warnings for storms, hail and heavy rain. • 25 kW peak power, 0.1% duty cycle magnetron. • 1.8 m diameter dual polarization antenna (1.4 deg. beamwidth). • Air conditioned RF unit for all-weather operation. • Equal power V/H polarization on transmit, separate receiver channels for simultenious reception of the V and H polarized backscattered field. • 15-150 m selectable range resolution. • PC-based 16-bit 2 channel digital receiver. • Digital coherent-on-receive for Doppler measurements. • Pulse-pair or full-spectrum operating and measurement mode. • Data products include reflectivity, Doppler, ZDR, Kdp, rho_hv. XPOL single pol radar reflectivity factor – Zh (top) and differential reflectivity – Zdr (upper middle) PPI images in snow. 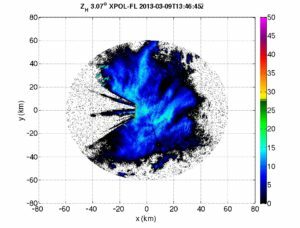 XPOL Doppler velocity (lower middle) and Rho_hv (bottom) PPI images in snow. Grazioli, J., Genthon, C., Boudevillain, B., Duran-Alarcon, C., Del Guasta, M., Madeleine, J.-B., and Berne, A.: Measurements of precipitation in Dumont d’Urville, Adélie Land, East Antarctica, The Cryosphere, 11, 1797-1811, https://doi.org/10.5194/tc-11-1797-2017, 2017. Kumar Vijay Mishra, Witold F. Krajewski, Radoslaw Goska, Daniel Ceynar, Bong-Chul Seo, Anton Kruger, James J. Niemeier, Miguel B. Galvez, Merhala Thurai, V. N. Bringi, Leonid Tolstoy, Paul A. Kucera, Walter A. Petersen, Jacopo Grazioli, and Andrew L. Pazmany. 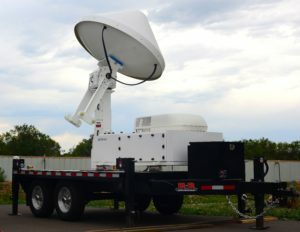 (2016) Deployment and Performance Analyses of High-Resolution Iowa XPOL Radar System during the NASA IFloodS Campaign. Journal of Hydrometeorology 17:2, 455-479. Grazioli, J., Lloyd, G., Panziera, L., Hoyle, C. R., Connolly, P. J., Henneberger, J., and Berne, A.: Polarimetric radar and in situ observations of riming and snowfall microphysics during CLACE 2014, Atmos. Chem. Phys., 15, 13787-13802, https://doi.org/10.5194/acp-15-13787-2015, 2015. 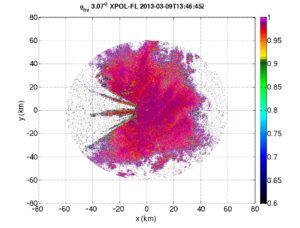 Wolfensberger, D. and Berne, A.: From model to radar variables: a new forward polarimetric radar operator for COSMO, Atmos. Meas. Tech., 11, 3883-3916, https://doi.org/10.5194/amt-11-3883-2018, 2018. 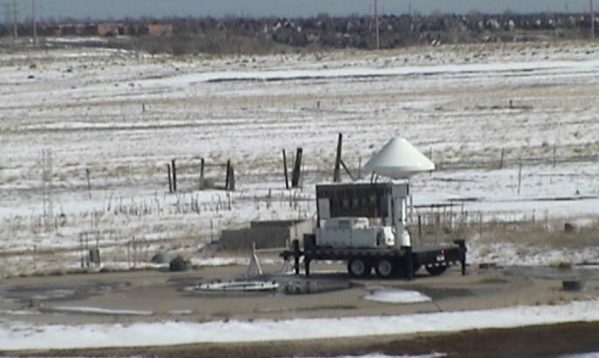 The NCAR XPOL at Marshall Field during the 2012-13 winter field experiment. 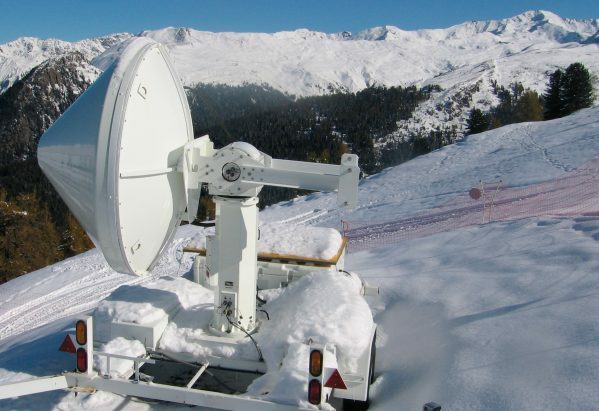 The EPFL XPOL operating on the ski slopes above Davos, Switzerland.